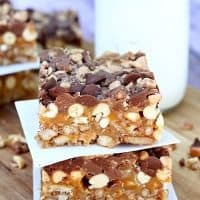 CHOCOLATE PEANUT PRETZEL TOFFEE BARS — Caramel, peanuts, two kinds of chocolate, pretzels and toffee bits all come together in this amazing bar cookie! 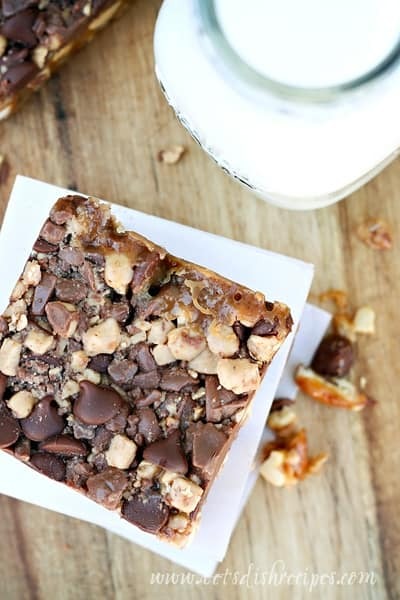 If you’re thinking that Chocolate Peanut Pretzel Toffee Bars is a mouthful, just wait until you try them! These bars are loaded with so many yummy things, and when you put them all together, the result is heavenly. I do not exaggerate when I say that the entire 9 x 13 pan of bars disappeared within 24 hours. Granted, I live in a house full of hungry teenage boys. Admittedly, I have a weakness for sweet and salty treats, so these were right up my alley. With pretzels, caramel, chocolate, peanuts and toffee, these bars have pretty much got it all. And although I haven’t tried substitutions with other nuts or baking chips, I’m sure that’s something you could do. Best of all, like most bar cookies, these are pretty easy to make–even with all the ingredients. The most tedious part of all is unwrapping the caramels, but believe me, it’s worth it! If you’re worried about eating the entire pan in one day like we did, you can freeze these bars for up to 3 months. Just layer them between sheets of waxed paper and place them in an airtight container. So, to sum up: make these Chocolate Peanut Pretzel Toffee Bars ASAP! You will not regret it. Well, you might regret how many you eat, but you will not regret how delicious they taste! 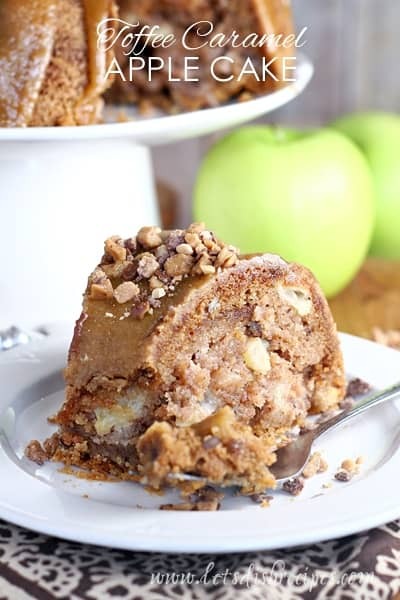 If you make one dessert bar this season, it should be these! 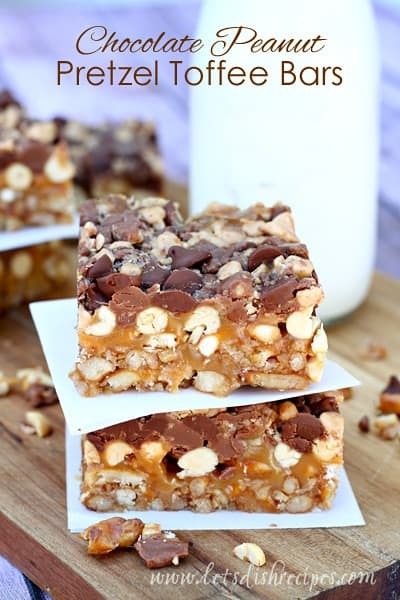 Be sure to save this recipe for Chocolate Peanut Pretzel Toffee Bars to your favorite Pinterest board for later. 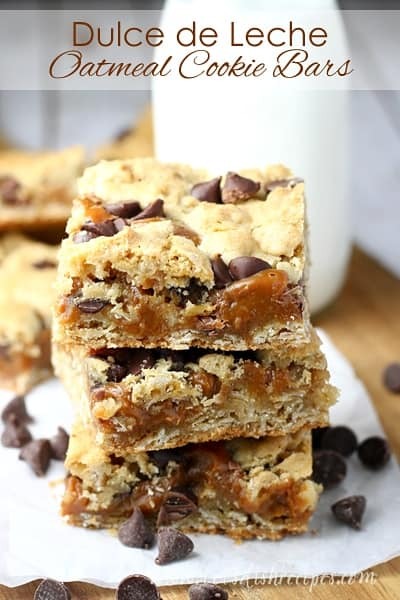 Caramel, peanuts, two kinds of chocolate, pretzels and toffee bits all come together in this amazing bar cookie! Preheat oven to 325 degrees. Line a 9 x 13 inch baking pan with foil, extending the foil over edges of pan. Grease foil and set pan aside. Melt 1 cup of the butter in a microwave safe bowl. Add the crushed pretzels and granulated sugar. Press the mixture firmly and evenly onto the bottom of the prepared pan. In a medium saucepan combine the remaining 1/2 cup butter, cream and brown sugar. Cook and stir over medium-low heat until butter is melted and brown sugar is dissolved. Stir in the caramel and cook, stirring frequently, until caramels are melted and mixture is smooth. Stir in peanuts. Quickly pour caramel mixture over crust, spreading evenly. 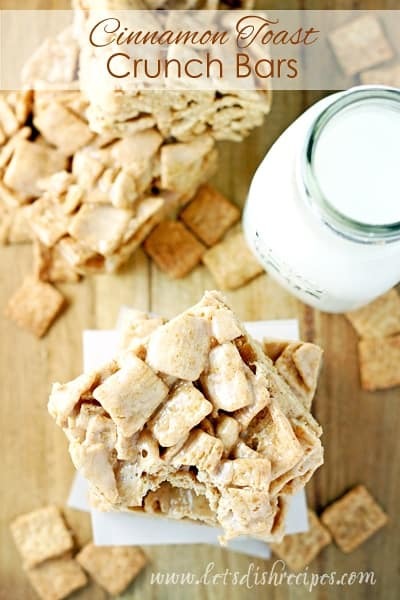 Sprinkle with chocolate chips and toffee pieces. Bake for about 25 minutes, or until edges are bubbly and lightly browned. Cool in pan on a wire rack. Using the edges of the foil, lift uncut bars out of pan and cut into squares. Your recipe says a 19×13 pan, which is the wrong size. We got a 11×17 pan and the bars are ruined because they’re too thin and we can’t get them out. You should fix the typo. It ruined my birthday bars. I made these last week. We used a 9×13 pan and while I’d let them cool completely, they were super messy and wouldn’t come out as bars. We just ate our portions by the spoonful! They were much better set the next day though, and the flavor was amazing. I’m a definite sweet/salty fan and these are awesome! !